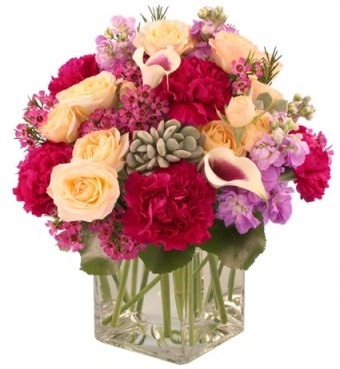 Everyday looks better with flowers from ENCHANTED FLORIST OF CAPE CORAL! We are located off Cape Coral Parkway West in Cape Coral Florida. We deliver weddings locally and on throughout Fort Myers, Fort Myer Beach, Pine Island, Useppa Island, Sanibel and Captiva. We do majority of destination weddings and always make our brides feel very comfortable throughout their process of picking and choosing flowers within their budget. We have an array of rentals, from arbor and columns to isle candelabras. We would love to hear from you for a consultation for your future picture perfect wedding! We take pride in creating anything you can dream up. From soft, romantic looks to edgy, modern looks to vintage, chic looks—and everything in between! We are a full-service florist, meaning we do more than just design a centerpiece to put on your table… we help design your entire event through flowers with the purpose of creating a cohesive look and feel with the sophistication of our expertise. Weddings are our favorite occasion and we are ready to help you plan the bouquets, arrangements and on-site decorating for your dream wedding or any special occasion - large or small. Call in advance 239-540-3353 and set up an appointment for a consultation. We also deliver and will host proms and school dances with corsages and boutonnieres at all High Schools, including but not limited to: Cape Coral High School, Oasis Middle School & Oasis High School, Island Coast High School, Ida Baker High School and all others in the Cape Coral and Fort Myers areas. We also offer beautiful 24k Gold-Dipped Roses, Solar Wind Chimes, Angel Figurines, Swarovski Crystal Prisms, Collectors TY Beanie Babies, Plaques, Porcelain Dolls and more. Thank you for visiting our website with flowers delivered fresh from your local Cape Coral, FL flower shop, ENCHANTED FLORIST OF CAPE CORAL!